Here’s a detailed tutorial about how to shop online. Let’s say you’re looking for tan ankle boots. In the search bar at the top of the site, type in women tan ankle boots and then hit the little magnifying glass. Now you have 1,152 pairs of women tan ankle boots to choose from. 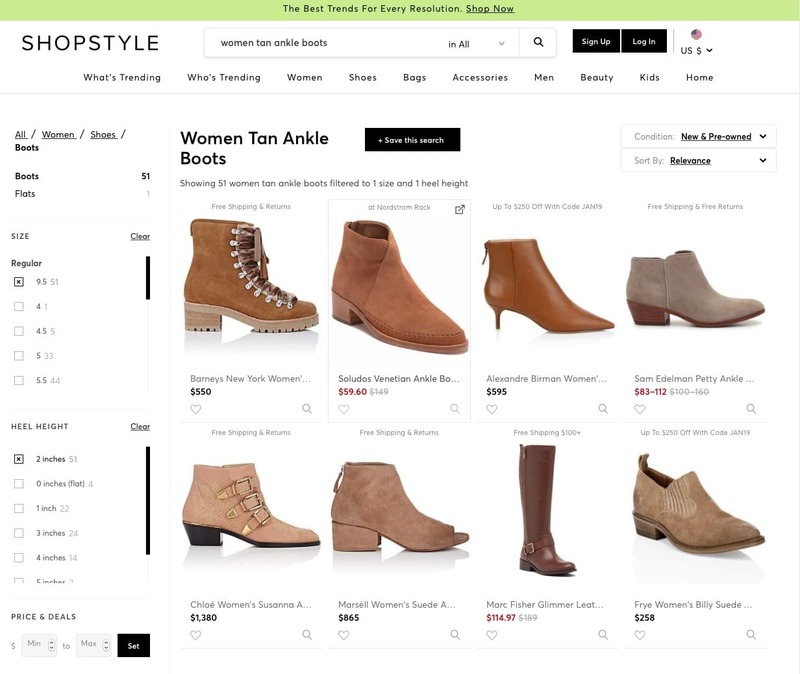 That’s a lot of boots, but you can narrow down your search by clicking on Size and Heel Height on the left hand side of the page. I clicked on size 9.5 and 2 inch heel height, and it narrowed down my search to 51 pairs of tan ankle boots that meet my criteria. 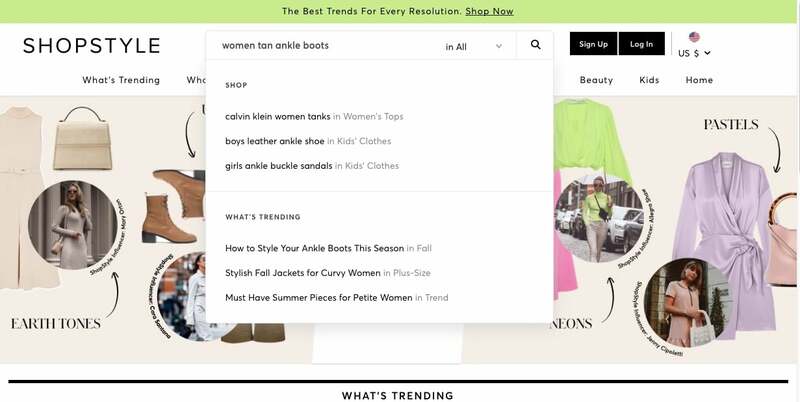 Another way to search is to “Sort by Relevance.” In the upper right hand window above the boots and you can search by lowest price, highest price, most popular, most favorite (not sure how that’s different from most popular but that’s okay) and newest. 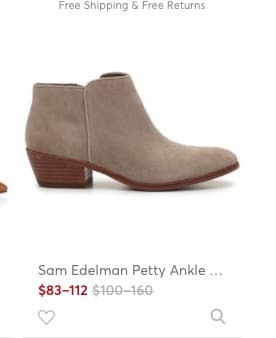 Out of these choices my favorite—that I can afford—is Sam Edelman’s Petty Ankle Boots, and I can see they’ve been marked down. 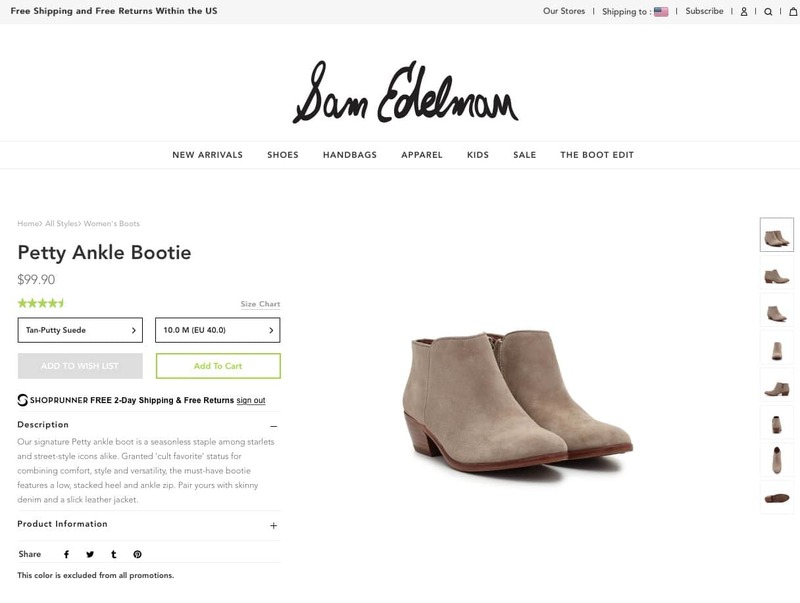 Click on the boots, and it will take you to those boots on the Sam Edelman site where I can now see eight different views of these boots. If you move your cursor over the boots, you can see the suede, the stitching and the soles magnified so you know exactly what you’re getting. 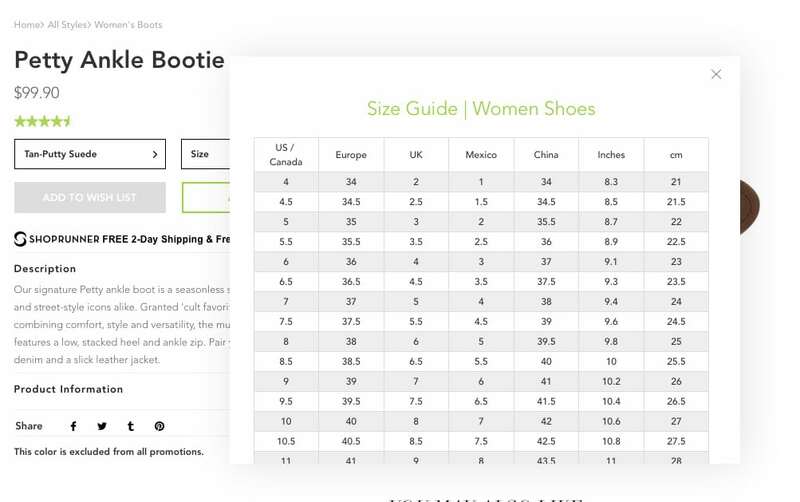 You can also see the Size Chart above the Size box. If you’d like to try the boots, but you’re not sure which size will fit you best, order two or three to try on at home. Most brands offer free shipping and free returns and include the return label with your order, so why not? I do it all the time. That said, some sites consider “Sale” items as “Final Sales” and don’t offer returns. Just scroll down to the bottom of the site and read their Return Policy before you purchase sale items. Last week my favorite Stuart Weiztman boots were on sale, but since they had a “Final Sale” notice on them, and I knew their return policy on sales, I passed because I didn’t know if they would fit me. I’ve chosen size 9.5 and clicked “Add to Cart” then gone back and chosen size 9.0 and added that to my cart as well. You can see I have “2 items” in my cart. 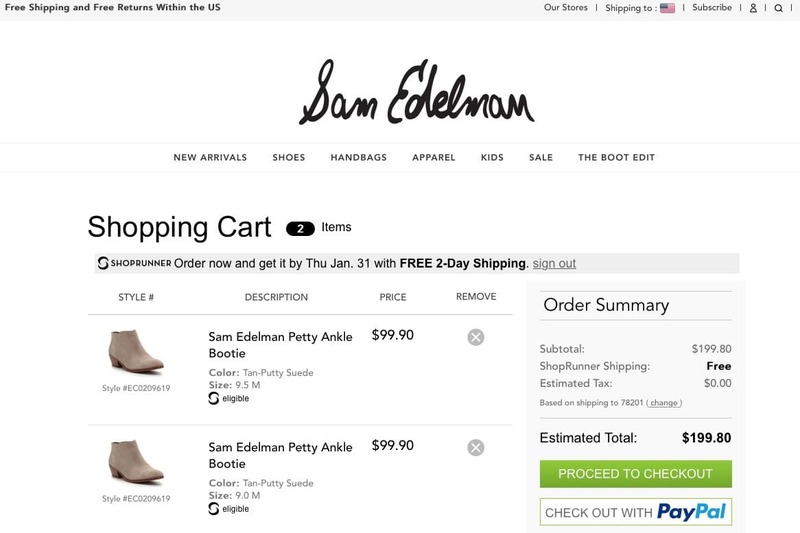 From here I can either “keep shopping” on the Sam Edelman site or I can go to my cart and checkout. If for any reason I decide to delete one of them, all I have to do is hit the X under remove. 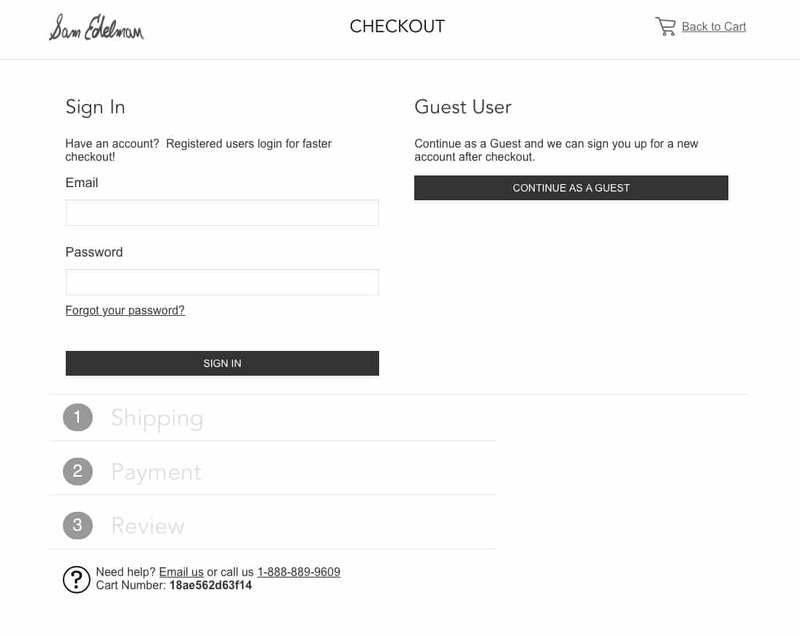 If you’re ready to checkout, then PROCEED TO CHECKOUT. I’ve bought dozens of things online in the last 10 years, and I’ve never had a problem giving my address, phone and credit card information and have never had a problem with brands putting me on their mailing lists. You may want to create an account by giving your email address and creating a password, or you can register as a “Guest.” When you’ve filled in Shipping and Payment method, you can Review your order. If you decide not to purchase the items you can either just leave the website (your items will remain in your cart for a day or two should you decide you want them) or you can click backwards until you see your Shopping Cart page (this site also has a “Back to Cart” icon in the upper right hand corner) and delete the items from there. Brands also have their phone number on each page, so don’t hesitate to call them if you have any questions at all. Here’s another post I did some time ago that might be helpful. Six Tips For Buying Clothes Online. For me online shopping is the only way to go. Your information is secure, and it’s much easier than spending the afternoon walking the malls or driving from store to store and not finding what you want. 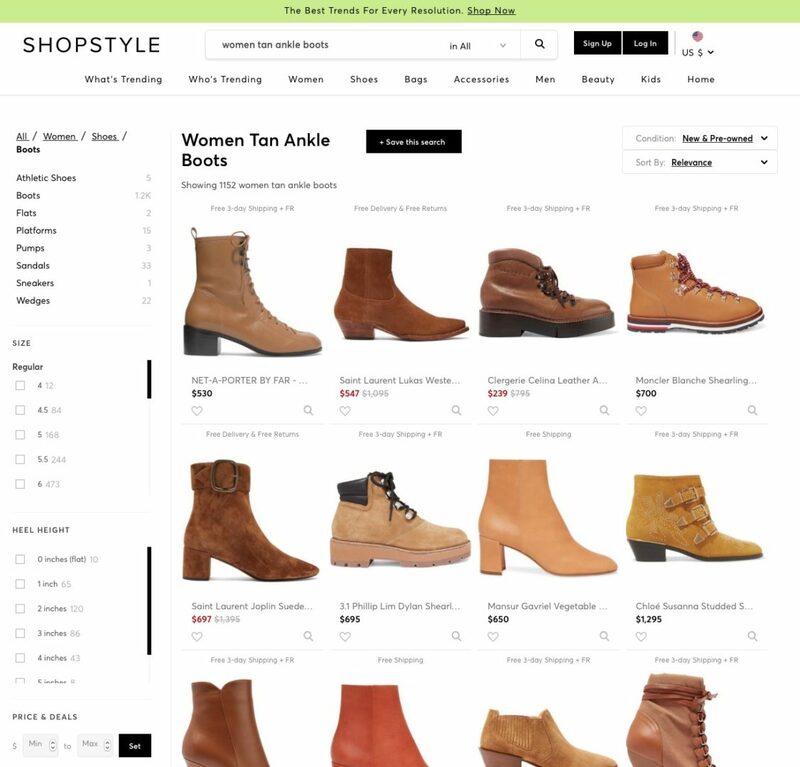 ShopStyle.com refreshes their site, daily, with new merchandise so you can window shop as often as you like. Happy shopping! What a helpful post for those new to the whole (and intimidating for the uninitiated) online shopping thing. Amen to everything you said – I couldn’t live without it. I do still make it a point to visit the local independent boutiques I want to see stay in business, and you’ve got to put your money where your mouth is if you want places to stay around…. But I love your blog and am so glad I discovered it. Thanks for helping women with some miles on the tires kick frumpy and dowdy to the curb. Oh, Brenda, thank you for a one-stop solution! I have four or five stores that I shop for everything, but Shop-Style sounds perfect. I hate to shop… the futility of wandering around looking (unless it’s a hardware store). I love the convenience of online shopping and heaven knows with free shipping, free returns, next day delivery, etc. it’s easier and more attractive than ever. I too hate a day wasted going store to store trying to sort through racks and racks of clothes – why some people enjoy this I’ll never understand. An exception to my shopping dread is the store provided personal shopper/stylist – hello Nordstrom! About twice a year I contact a shopper and Nordstrom who pulls together wonderful outfits and accessories for me and I spend a couple of hours in a large dressing room trying things I would never have pulled for myself. It’s a great way to learn new ways to put outfits together and step outside your comfort zone. I also contact her when I have a special occasion and I take my nieces in for help with their proms, and other events. It costs nothing (although I probably spend more than I would have on my own) and sends me home feeling good and with a new perspective. I will have to check out Shop-Style. I also buy almost everything online. Since husband has been sick I can’t waste what little down time I have at a mall.